RecordMyDesktop is a tool to create screencasts in Linux easily. A screencast is a video capture of your desktop – a video equivalent of a screenshot. First start the application – that’s in Menu > Multimedia > gtk-recordMyDesktop. There will be a small image of your desktop inside this application – drag a rectangle inside this preview area to select the record area. Once the selection is made, there will be a bigger rectangle on your screen highlighting the record area. Only the space within this area will be captured. When this icon is a gray square, that means its recording. 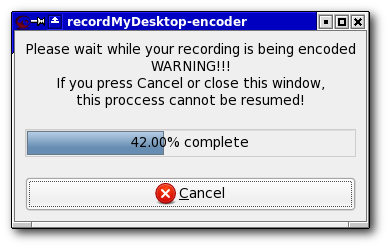 You can end the recording by left clicking on this icon. This show a new window that will show the status of encoding of the captured video. Depending on the size and length of the captured video (and your processor speed), this might take a long time. Once this process is completed, you will be shown the main window once again. Now click on the ‘Save As’ button to save the file as a ogg Theora video file. That’s it – you have created your first linux screencast! Congratulations! Feel free to play around in the application – and make some screencasts. One you have done that, upload it to youtube – and post the URL in the comments. Here is my first screencast. A screencast that shows you how to create a screencast using recordMyDesktop. The background music is ‘Recursion’ by Michael David Crawford – I thought it was appropriate. Hi BinnyVA… it’s the first time that i write in your blog, but i’ve reading it since 3 weeks ago, and i like me very much. Thanks by your posts! – it save the video with very good quality and not a lot of Mb…. perfect! – when you are defining the area to film of your desktop, you have a button to directly choose one of the windows you have opened! fantastic. The package name is indeed the same in Debian/Ubuntu. Thanks for the tips. That zoom effect is very useful when creating screencasts. How do I zoom in and out with gtkrecordmydesktop? can you please make a screencast for that?